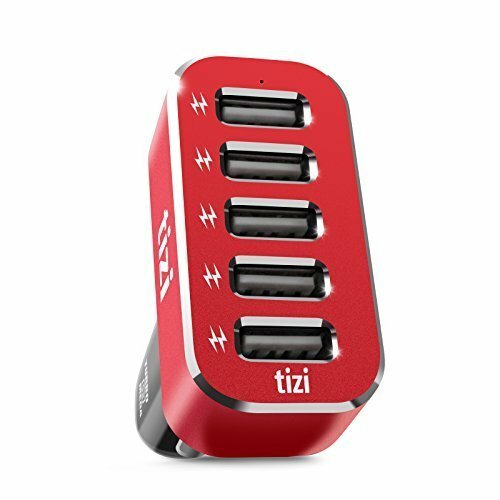 Now you can charge just as many devices in your car as you would at home: The new tizi Turbolader 5x MEGA charges up to five USB devices simultaneously with the 12V cigarette lighter socket in your car. The best part is, tablets and smartphones charge up to 3x faster than with the leading built-in USB car ports, and thanks to Auto Max Power, this is valid for devices from any manufacturer. Up to 3x faster than leading built-in USB car ports. With the tizi Turbolader 5x MEGA, the phrase "Connected Car" has a whole new meaning: a powerful charging device for the car which delivers the optimal amount of power (up to 2.4Amp per port) to all beloved mobile phones and tablets, no matter what brand they are. Many USB chargers reach their limits when a navigation app is running. The tizi Turbolader 5x MEGA, on the other hand, charges up to five devices with high power (up to a total of 12Amp) even while a navigation app is running. Even on short rides to work, appointments etc... the Turbolader proves its power, delivering enough energy to get you through the day. You're sure to be convinced by the tizi Turbolader 5x MEGA: Just order one, and try it out for 30 days without any obligation. If you are not convinced by the high quality of the Turbolader, send it back to Amazon and we'll reimburse you the purchase price. If you have any questions about this product by Equinux, contact us by completing and submitting the form below. If you are looking for a specif part number, please include it with your message.